Exhibition centers count different types of hardware displays to communicate with exhibitors and visitors. 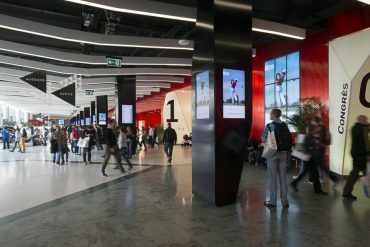 Generally you will find massive LED screens outside venues and at the entry of centers; these mainly communicate advertising or special information about the exhibition. 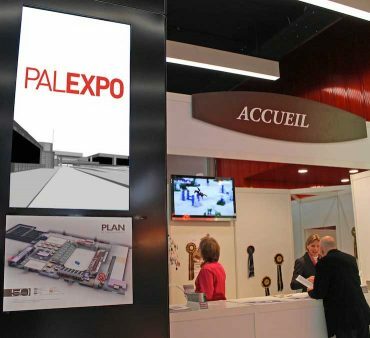 Inside the exhibition centers you generally find screens and displays of all sizes and used for multiple purposes such as menu boards, live internal TV, bathrooms, hallways, corridors, meeting room names & timings or interactive wayfinding kiosks. The main purpose is to keep the audience of convention centers informed and entertained at all times between meetings or during their breaks. Large screens can also be found inside buildings to display and communicate targeted information or to showcase conferences or social presentations like projectors used to do. Welcome, inform and provide updates. Mix between still images and video contents. Manage the information you wish to showcase.